I have four different sized Mickey Mouse clay castings that I need to make a mold of so that I can cast resin copies of them. I normally like to use silicone putty for the resin molds but for these four, I need to use liquid silicone because the smallest one is only 1/2". Now let that sink in - 1/2" will fit on a DIME so imagine how TINY the lines on it are. Yeah definitely need to use the liquid. So my problem was that I didn't have anything that would be the right size or shape to make a mold box for all of them without having a lot of wasted space around them - I work with hard/sturdy plastic so nothing I had on hand is anything I could shape into a temporary mold box. Then light bulb moment - I had Remelt and the liquid silicone does not heat up! So I could use the Remelt (making sure to spray with a release) as a shaped, temporary mold box to pour the HS-2 into to make the molds for the resin! I would waste a lot less HS-2 and the Remelt is reusable so no need to use a dedicated mold box for a shape I might not need again. 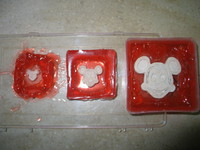 So here's a picture my "temporary" Remelt mold boxes. Yes they're not very pretty or shaped well but they'll do the job and that's all that matters. Pictured left to right: 1/2", 1", and 2" (3rd size is 1 1/2" and isn't pictured). The resin castings are for a non-food mold and I *could* use these clay castings but I like resin better as it holds up to any abuse I might throw at it. Plus I am definitely making some clay stamps from those faces (worked for days on them) and the resin castings will give me a better surface to copy from. Crazy no, inventive and imaginative yes! Way to go Notoes. I love Mickey! Thanks, you should see the smallest one under a magnifier - the detailing is perfect. They all came out very nice but they took hours and hours of work, well worth the aching back. And an update on these: I have demolded all four Mickeys and not only did the detailing (inside) come out perfect (which I expected), separating the Remelt and the HS-2 was extremely easy and I wasn't expecting that to be very easy even though I applied a release. I only have a couple spots of flashing to cut off but I was expecting that. The molds themselves came out to be a perfect size thanks to the Remelt.